We harvested a ‘grand’ total of £88 worth of veg this week, excluding anything from the store. We had 33 meals with ingredients from the allotment and fed two other families. Here’s a photo of one of the three harvests we did this week. 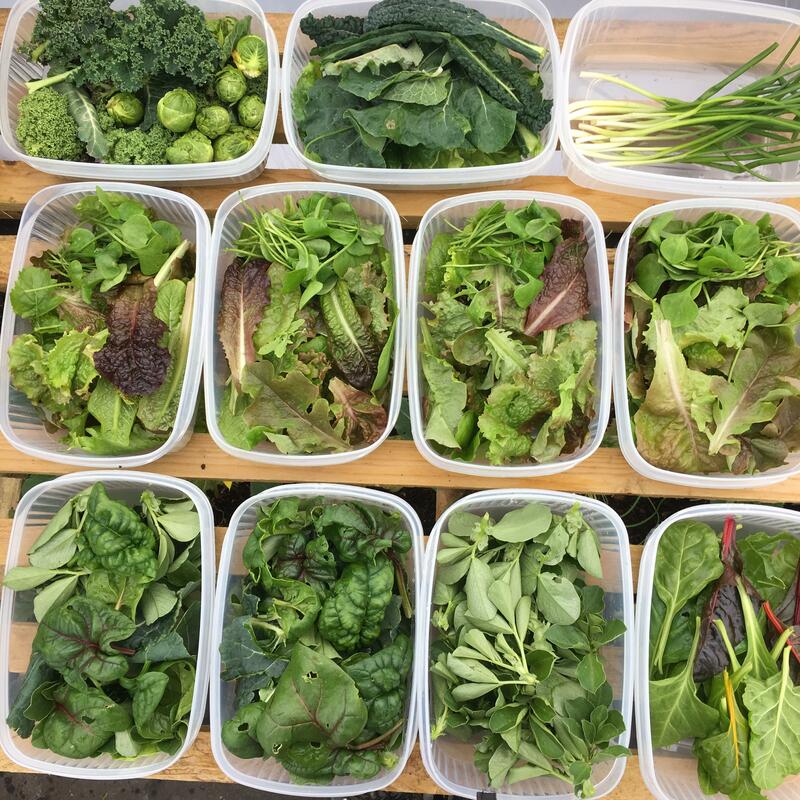 We picked new potatoes, broccoli, Romanesco cauliflower, sprouts, lots of types of kale, spinach, mizuna, giant red mustard, chard, kalettes, golden beets, spring onions, celery, rocket, lots of bean tops and loads of lettuce. We also raided the store for: carrots, potatoes, onions, shallots, garlic, red beetroot and dried pears/apples. I published four videos, first: Mulching Fruit Trees and Keeping Busy When It’s Freezing! The second batch of potatoes (Swift) broke through this week, they’ve joined the first batch of potatoes (Charlotte) in the polytunnel. The rash I had last week is still lingering,it’s no longer itchy, but it came back when I tried to reduce the steroids, so I had to step us the dose again! We’ve got a few slight aphid problems in the greenhouse and polytunnel, so I’ve made up a batch of home made garlic spray and I will be using that regularly from now on. A few of the lettuces had downy mildew on the leaves and we lost a few plants to rotten stems, that always happens at this time of year. You are getting some amazing harvests! Those greens are lovely. Welcome to Harvest Monday! I don’t believe I’ve read one of your posts before. You have a very impressive garden. If I understand your post last week was your first harvest of spinach and Romanesco. In my seaside garden in San Diego, CA last week was the first week of those two crops for me too. We do love our greens!